Adware applications that generate their names randomly usually arrive bundled with other programs. Shopncompare is precisely that kind of program. Its name may appear as ShopNCompare, SHOopnComparre, ShopNCOOmparee on the list of installed programs, but it is still the same application. This program displays Shopncompare ads whenever you access online shopping websites. It may seem that these ads can help you save money on your purchases online, but that is hardly the case. You need to remove Shopncompare from your computer because adware programs eventually lead to a variety of computer security issues. This program has an official homepage at Shopncompare.info. The information at the official homepage claims that this browser add-on can help you make shopping “fun and easy.” When you visit your favorite online stores, “this tool works its magic by retrieving all the available deals, discounts and coupons and presents it all to you in an interface.” Shopncompare ads are compatible with Internet Explorer, Google Chrome and Mozilla Firefox web browsers. Thus, no matter which browser is your default one, if you install Shopncompare on your PC, you can be sure to receive a lot of pop-up ads. Despite the fact that this program has a homepage, the direct download link on the page does not work. It is not surprising, because Shopncompare is similar to BestSaveForYou, DownSave, AllCheapPrice, and other programs that are based on JustPlugIt engine. Rather than distributing them via official homepages, their creators include the programs into bundled setup files. These setup files are available for download at third-party websites. 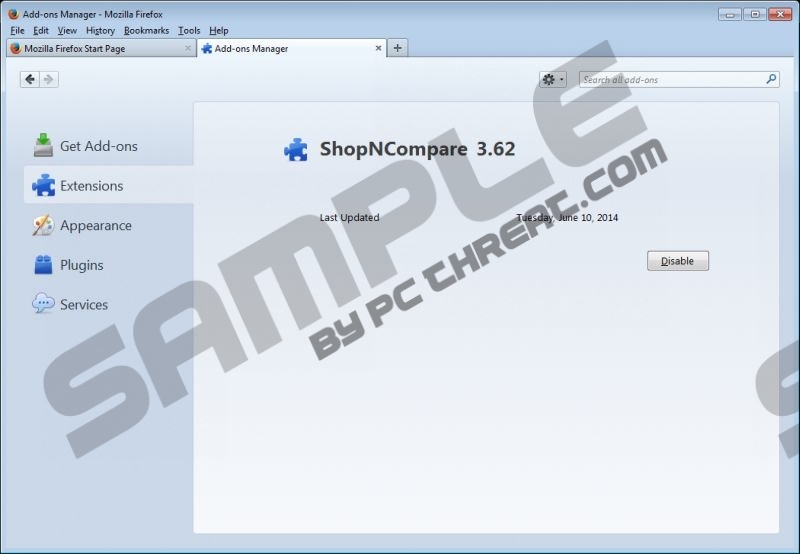 As a result, Shopncompare ads travel with the likes of Websearch.amaizingsearches.info browser hijacker, EZDownloader adware and other unwanted programs. It is true that such adware applications are more annoying than dangerous. Shopncompare ads may slow down your browser, but unless you click them, nothing will redirect you to unfamiliar websites. Thus, you have to feel responsible for your system’s security. Do not forget that Shopncompare ads make use of third-party advertising servers to create content for its ads. It means that it cannot be held responsible for the third-party content security, and by clicking these ads you could find yourself on an unfamiliar website that distributes adware! Therefore, you have to remove Shopncompare from your computer in order to ensure that your PC is safe and secure. Access Control panel and remove the application from the list of installed programs. Afterward, you will have to delete the add-on from your browser’s extensions menu because manual removal via Control panel affects only Internet Explorer web browser. Finally, invest in a powerful antimalware tool and run a full system scan that will help you determine where you have other unwanted applications on board. Remove them all automatically and safeguard your PC from any potential threats. Open Uninstall a program and remove Shopncompare. Select Uninstall a program and remove Shopncompare. Select Add or remove programs and uninstall Shopncompare. Open Extensions and remove Shopncompare from the list. Disable and remove Shopncompare from Extensions. Quick & tested solution for Shopncompare ads removal.